Did you know that vanilla comes from orchids? 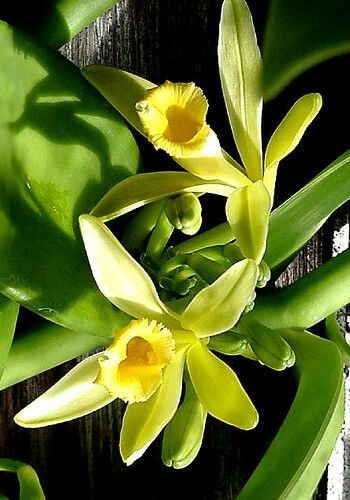 Vanilla orchids are vines with bright green, fleshy stems and leaves that grow singularly and alternately along the vine. Flowers grow in clusters of 12 to 20 buds, are usually about 6 inches long and yellow-green. The flowers bloom over the period of a month, and if pollinated, can potentially produce fruit (seed pods). The pods are harvested before fully ripe and then cured to create vanilla flavoring. Sadly, the blooms only last one day; opening in the morning and closing at night. Vanilla planifolia is one of over 60 species of Vanilla orchid and has been around for almost 500 years. The Aztecs discovered the plant in Mexico in the early 16th century and used the seed pods (vanilla beans) to counteract poisons, to aid digestion, and as an aromatic, exotic flavoring for Emperor Montezuma’s beverage. In 1518, Cortez snagged some vanilla, took it back to Europe and created vanilla flavored chocolate. Queen Elizabeth I began using vanilla flavoring on its own, and soon all of Europe clamored for more. Unfortunately, no one could successfully grow Vanilla orchids outside of Mexico. In 1836, Belgian Charles Morren discovered why. Vanilla orchids were pollinated by the Melipona bee, which did not survive outside Mexico. So, Morren pollinated the plants by hand. Later on Reunion, an island off of Madagascar, former slave Edmond Albius perfected an easier method to hand pollinate. This method is still used today. Vanilla orchids grown indoors rarely flower or produce fruit. The vines must be mature to flower, which means 2 to 3 years old and at least 10 feet long. Or should I say ten feet high? These vines grow straight up, and can reach lengths (heights) of over 100 feet. Few homes have that kind of headroom. A garden or a greenhouse is a better place to grow Vanilla orchids. The plants need a vertical support, well-drained fertile soil (humus is good to start), bright light in the morning and bright shade in the afternoon. 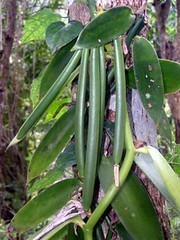 Vanilla orchids are epiphytes (air plants), and produce aerial roots from nodes opposite the leaves. These aerial roots must be fed and watered until the vine is established on the support. Keep daytime temperatures between 80 and 90 degrees Fahrenheit and between 30 and 70 at night, and keep the humidity high. To provide moisture, running a humidifier (if grown in greenhouse) may also be necessary. Water frequently, at least 2 to 3 times a week, but never let the roots get soggy. Regular misting is good, too. Then sit back and enjoy the show, because a healthy Vanilla orchid vine can grow for seven or eight years and can produce as many as 1000 flowers. Photos by acfou – used under Creative Commons License.